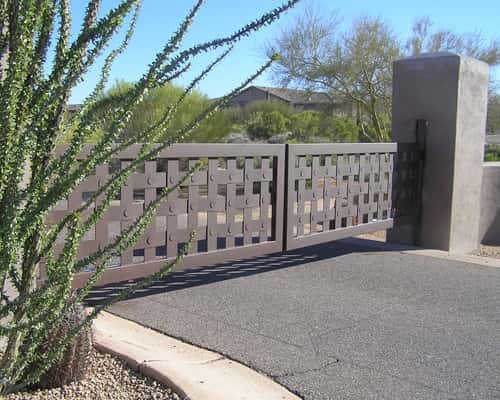 Sun King Fencing & Gates has been providing high-quality wrought iron fences and gates for homes throughout the Phoenix Metropolitan Area for over 15 years. Quality installations, attention to detail, and superior customer service are reasons for our success. Sun King Fencing & Gates designs decorative and pool fencing specific to your property's needs and aesthetic appeal. Our work is custom-designed and uses no prefabricated fence sections. The reason that we do each and every fencing job custom is to provide you with a beautiful and functional fence. One of the great things about working with wrought iron is that we can shape and curve ornamental fencing or gates to match an arch in the house, follow the curve of pool decking, or give you exactly the look you want. 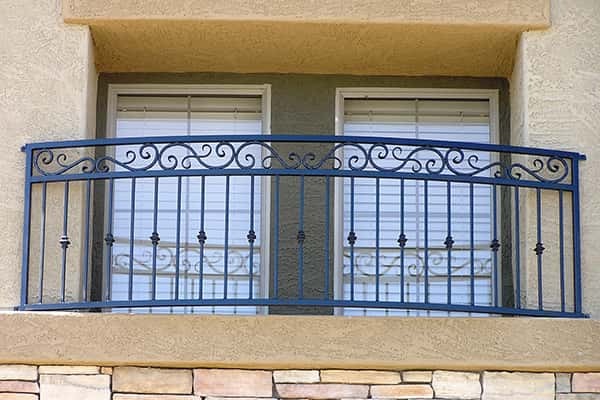 We have put together a team of experienced wrought iron fabricators and installers that can turn your ideas into safer and more beautiful fences and gates. You can add ornamental touches to a gate, for instance with a simple arch, that immediately attracts people's eyes. Adding decorative, hand-hammered Italian scrolls really sets off the look of that arched gate. Pieces higher on the fence or gate, such as ball-tops on posts, give you a decorative, custom look without the expense of putting the detail on the entire fence. Convenience and safety features such as deadbolts and handles are also available. 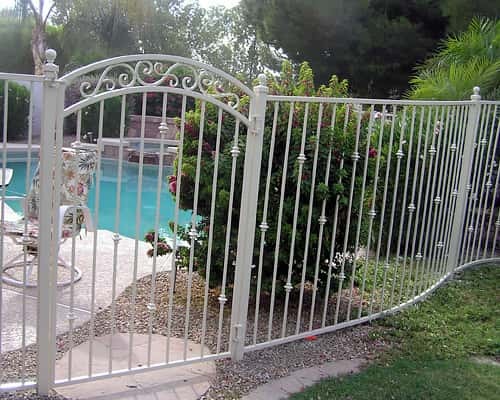 "We fabricate every fence and gate at our shop in Mesa, Arizona." 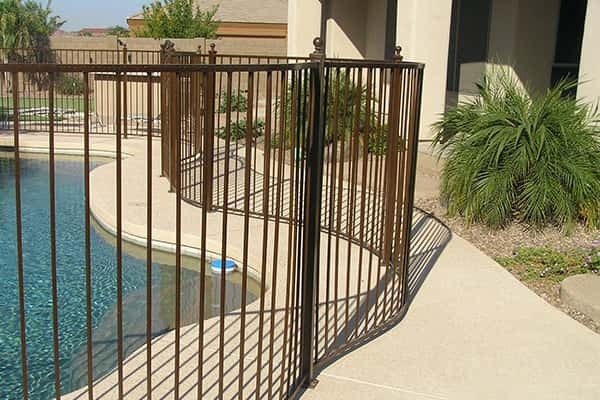 What makes Sun King Fencing & Gates so unique is that we fabricate every fence and gate at our shop right here in Mesa, Arizona. We use only the highest quality bulk iron that is fabricated by our experienced welders. Once your wrought iron gate is completed, we apply an epoxy-based primer using an electro static paint gun in our paint booth. Next, we apply an environmentally safe polyurethane paint to match your color needs. The polyurethane paint wraps the steel with a hard outer shell protecting it from water and sun damage. Sun King Fencing & Gates has also been selected to be the exclusive wrought iron fencing and gate company for the syndicated radio show and organization RosieOnTheHouse.com. A thorough screening process and customer evaluation allowed us to be selected as the exclusive partner for this trade. Arizona homeowners know that Rosie on the House partners with only the best home improvement and home services companies in the state. 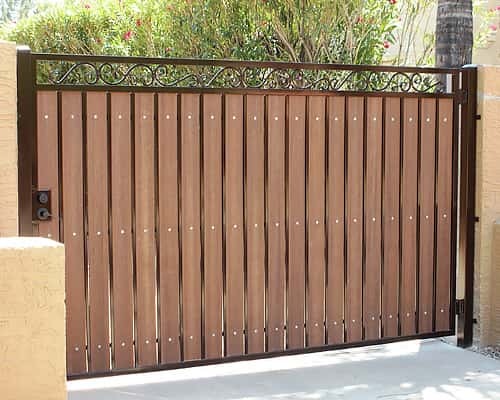 Choose a fencing and gate company that will design and manufacture your fence and gate to complement your home. Have an idea for a custom fence or gate? We can help design, build and install it. For more information about your options and our capabilities, give us a call at 602-989-0839. You can also reach us with any questions using the provided contact form.